This is great news I hope for all the handball readers of my blog. 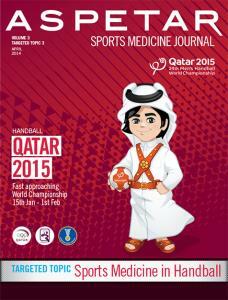 Aspetar Sports Medicine Journal, which you can receive for free in print and access online if you subscribe has just published a special issue on Handball. This issue was developed by the editor in chief Dr. Nebojsa Popovic, an excellent Sports Medicine specialist with a glorious past as a handball player (Olympic Champion with ex-Yugoslavia in 1972) and contains an excellent series of articles on various aspects of handball. I wrote something about strength training available here. So if you are working with handball players or you are a coach, make sure you don’t miss this special issue of Aspetar Sports Medicine Journal. You can read large parts of books and/or entire books for free. I found many books very useful for Sports Scientists. I strongly suggest the readers to use it!